NNECOS offers its member practices an opportunity to advertise on our website and in periodic email communications. This has been designed as a networking opportunity; NNECOS does not intervene in any negotiations between the parties involved. 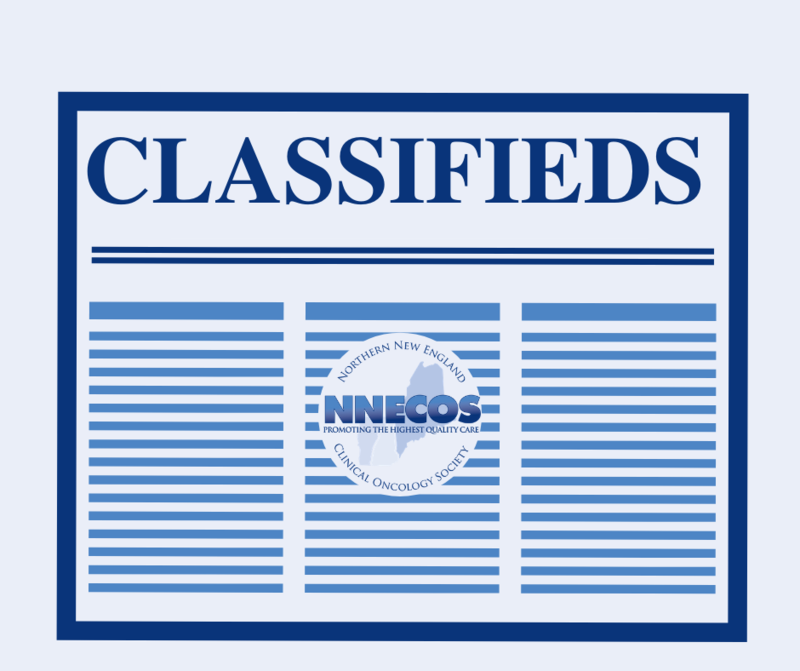 There is no cost for NNECOS members to place a notice. Requests by individual members will be reviewed on a case by case basis. Submit your posting to info@nnecos.org. Cape Cod Hospital seeking a physician BC/BE in Medical Oncology and Hematology. The Healthcare System’s cancer services provide a complete range of advanced cancer treatment options, highly trained specialists, and top-notch facilities. The cancer center, located on the campus of the hospital, has a dedicated oncology pharmacy, an infusion room for 12 patients along with a full-service radiation oncology department. Over the next couple of years, we will be embarking on a new hospital building that will increase the oncology space and infusion space two-fold. The hospital has a brand new academic affiliation with Dana Farber with the opportunity for Phase II and III clinical trials and clinical research. The cancer program is accredited by the American College of Surgeons as a comprehensive cancer center, and by the American College of Radiology. Join four BC Medical Oncologists/Hematologists, four Radiation Oncologists, a support staff of eight RNs, one research RN, and two NPs. Hospitalists admit patients. Call is 1:5. On average, the group sees 32 new consults per week; 238 follow-ups per week; 85-90 chemo patients per week; and four inpatients per day. Competitive two-year income guarantee plus productivity bonus. Benefits include malpractice, health, dental, life and disability insurance; four weeks’ vacation and one week CME time; 403-B retirement plan; paid professional expenses; and relocation assistance. The Division of Hematology/Oncology at the University of Vermont Larner College of Medicine and its teaching hospital, the University of Vermont Medical Center is seeking a solid tumor oncologist at the Assistant/Associate/Full Professor level on the Clinical Scholar Pathway. Expertise or interest in melanoma, genitourinary, head & neck or lung cancer as well as clinical trials, translational research, medical quality or health outcomes are of particular interest. Opportunities to develop and implement a cancer clinical trial program with an emphasis on translation and therapeutics in her/his area of expertise are available. Candidates with expertise in health outcomes research are also encouraged. In patient responsibilities vary with interest and clinical need, but in general does not involve more than 10 weeks/year. Active participation in scheduled multidisciplinary conferences and enrollment of patients in clinical trials is expected. Founded in 1974, the University of Vermont Cancer Center at the University of Vermont (UVM) College of Medicine enjoys a clinical partnership with the University of Vermont Medical Center. The organization is comprised of more than 120 scientists and physicians engaged in a full range of basic, translational, clinical, epidemiologic and outcomes research that seeks to uncover new knowledge. Our established clinical research program offers participation in trials sponsored by local investigators, the NCI National Clinical Trial Network (NCTN), and industry. The University of Vermont holds main member status within the Alliance for Clinical Trials in Oncology. The University of Vermont Medical Center is currently major tertiary academic medical center in an expanding network of community and regional medical centers in Vermont and northern New York State called the University of Vermont Health Network. Applicants must be ABIM eligible or certified in Medical Oncology with a demonstrated potential to support clinical research and must be eligible for licensure in the State of Vermont and hospital privileges at UVM Medical Center. Board eligible applicants must be within 3 years of fellowship completion and must obtain board certification in medical oncology. There should be evidence that the individual has the potential in terms of clinical performances, scholarly activity and teaching to meet University criteria for retention and promotion. The ideal candidate will be accomplished interdisciplinary teacher, a skillful clinician and have appropriate research experience. Full-time (40 hrs/wk), RN position available with regional medical oncology practice. We are looking for a caring and highly motivated Infusion Nurse to cover our Concord location (Hooksett coverage on occasion). Chemotherapy administration experience and good IV skills are recommended, but we are willing to train the right person. Candidate should have current NH RN License (or be eligible). BSN & OCN preferred, but not required. No weekends, holidays, or nights! The Nursing Supervisor provides leadership, consultation and collaboration with the goal of facilitating the provision of high quality care and service to a defined patient group or clinical area. The Nursing Supervisor serves as a resource to the organization and the community for information related to care within that area. The Nursing Supervisor must have an intense commitment to high level customer service, and the ability to foster that culture within the site or sites they manage. State of Vermont Registered Nurse (RN) license required. The University of Vermont Medical Center is moving toward an all Bachelor of Science in Nursing (BSN) workforce. All external candidates hired into, or current employees promoted to, a RN position will be required to obtain their BSN as outlined in the terms of their offer letter. Current internal RNs are strongly encouraged to pursue a BSN to support this initiative. Master’s degree in Nursing (or Nurse Practitioner Program), Business Administration, or Health Care Administration preferred. Three to five years RN experience in area of specialty care. Three to five years supervisory experience, preferably in office setting. Hematology/Oncology experience preferred. Maine Medical Center Cancer Institute is seeking a Nursing Supervisor for their Radiation Oncology Department in Scarborough. The position will oversee the day-to-day nursing operations for the department. The selected candidate will manage a staff of 5 employees at various radiation oncology sites in southern Maine. Daily duties will include but are not limited to: working collaboratively with and being part of a multidisciplinary team for problem solving; guaranteeing high patient satisfaction scores; ensuring staffing-level needs are met; mentoring and developing team members; and overseeing quality and process improvements ensuring a consistent and seamless patient experience. Our ideal candidate must hold a current RN license in the state of Maine. A BSN or MSN is preferred. Previous experience working with oncology patients is required. Although not required, prior positions in an outpatient setting and previous supervisory experience will help to guarantee success in this position. Oncology Nursing Certification is highly desirable. The Supervisor must assure that the nursing needs of Radiation Oncology patients are met by the continuous assessing, planning, delivering and evaluating of the effects of comprehensive care designed to meet the changing needs of the patient and family; contributes to the professional growth of other departmental personnel and participates in achievement of other department goals and objectives. This work may be performed at any of the Radiation Centers operated by Maine Medical Center. Current license to practice as a Registered Nurse in the State of Maine; Oncology Nursing certification preferred. Bachelor of Science in Nursing or Master’s preferred. Interpersonal and management skills and knowledge of employee relation laws as normally acquired through completion of a Bachelor’s degree in nursing in order to deal with complex management problems and communicate with unit personnel, physicians, administrative personnel and a variety of other hospital personnel and community persons. Clinical expertise in direct patient care as normally acquired through approximately seven years’ experience as a staff nurse and/or supervisor. High level of analytical skills to make management decisions at unit level and make recommendations for consideration of departmental issues. Demonstrated ability to train/teach preferred. To apply, please click here or visit www.careersatmainehealth.org.